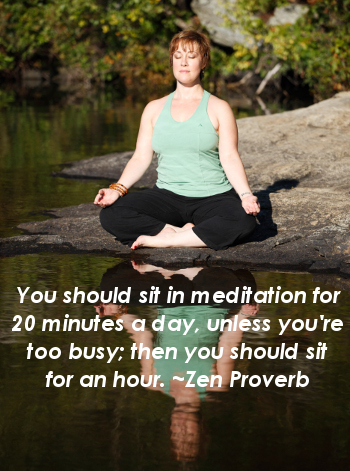 For years I’ve used meditation as a way of judging myself. Sounds odd, right? But as much as I practiced yoga, I have had the most difficult time getting a meditation practice to STICK and a small part of me judged that in a very negative way, like somehow I was failing as a “good” person/yogini if I didn’t sit every day for 30 or 60 minutes. PUH-LEEZE. Seems silly to me now, but that’s what I did. It’s not that I didn’t have activities in my life that contained meditative qualities, I did. I love chanting in the car, taking yoga classes, and hiking mountains (let’s face it, if you don’t stay aware and in the present moment while hiking injuries can and do happen … meditation is built in by default.) Simply sitting on my deck and listening to the wind in the trees is a favorite, too. But, I didn’t necessarily do those activities every day. And there were plenty of days in which I chose less than meditative activities to de-stress—watching tv or movies, reading novels, having a couple cocktails out with friends. All these activities themselves certainly provide some brief respite from the stresses of the day, and they’re genuinely fun, but none of them offered me true mental space and rarely did they offer the opportunity for personal insight. I’d stop watching tv, or finish my novel, or come home after drinks and dinner out and I’d still have all the stress-causing thoughts running through my head and messing up my sleep. So, when I saw that notice, I wanted to take advantage. I *know* I don’t want my life as a business owner to run the way my life as a corporate employee ran. So far, I’m having fun, but it’s not stress-free. I don’t have a steady paycheck; I have to work hard to find, cultivate, and nurture my clients so I can build the business I want and need. 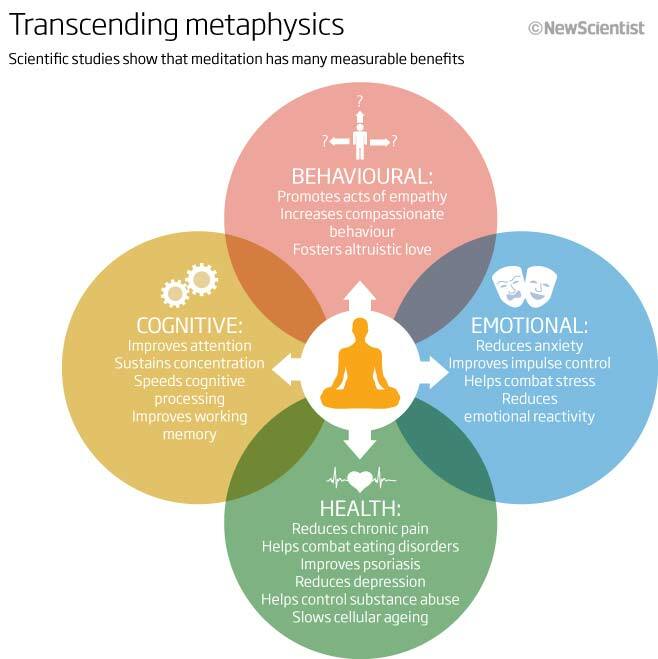 I know there are so many proven physical, mental, and emotional benefits to meditating. And because I’m learning an awful lot about asking for help, this study showing up seemed like one more step on that journey. I contacted the coordinator and after a phone interview and a two-hour in-person assessment which also disclosed the requirements to participate (not small! ), I was accepted into the eight-week study. Four Weeks … The Start of a Lifetime’s Practice? I’m four weeks in and find myself still challenged to “fit it in.” It’s sooo easy to fall back on the habit of putting myself last and always needing to do one more thing, take care of one more thing, or just fit one more task into the day instead of doing my daily meditation, which thus far, has been everything from learning which “anchor” is the one I most like to use (in our case, hands, feet, and nose, chest, and belly breath), 3-minute breathing practices, cultivating certain mindfulness qualities, and even various moving meditations ranging from 35-45 minutes. Via daily reports, all the participants have to be accountable. We made the commitment to participate, and we have to own it when we don’t … and it just never feels good to admit that I just blew off meditation for a day or two. I will happily admit that I am beginning to see improvement in my sleep. And I don’t seem to be having quite as many adrenaline rushes as I used to experience (adrenal fatigue being just one of the chronic stress-induced issues with which I’m still dealing.) And I also must admit that if I do blow off a day or two … I MISS it. I feel like my mind is beginning to have a little more space. And honestly, last week was one of the most creative and productive weeks I’ve had in a while and I suspect that’s due to having a little more of that mental space. Is this study done using Transcendental Meditation?